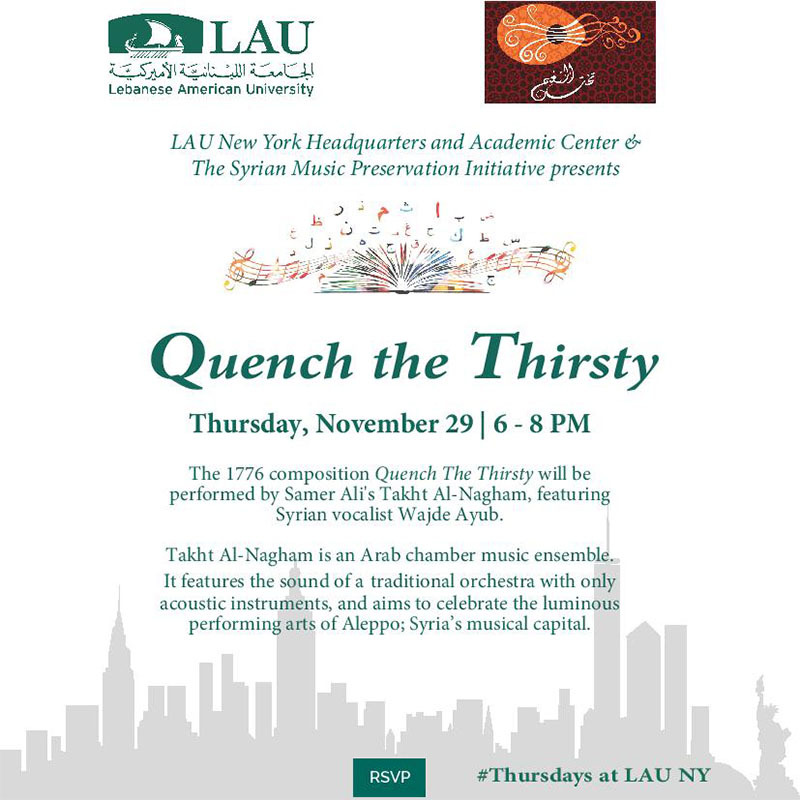 LAU NY and the Syrian Music Preservation Initiative presents the 1776 composition “Quench The Thirsty” with Samer Ali’s Takht Al-Nagham featuring Syrian vocalist Wajde Ayub. Takht Al-Nagham is an Arab chamber music ensemble. It features the sound of a traditional orchestra with all acoustic instruments and aims to celebrate the luminous performing arts of Aleppo, Syria’s musical capital. Isqi Al-‘Itash (Quench the Thirsty) is a musical composition that was written during a difficult drought in Aleppo. The composer Mohammad Al-Manbiji, in an eloquent adjuration to the Almighty, begs his maker’s forgiveness to release his people from their struggle. Takht Al-Nagham is a New York-based Arab ensemble featuring the sound of a traditional takht (Arab chamber music group). Following the vision of its founder Samer Ali, it is committed to performing the classical Syrian repertoire with traditionally all acoustic instruments. In order to familiarize audiences in the U.S. with the original structure of the musical traditions, the takht presents its sets (called wasla in Arabic) in the same manner that they were originally performed over a century ago: without reading from sheet music and relying heavily on improvisation. Participating in this performance will be musicians and vocalists. “Nagham” means melody or tune in Arabic, and is also used as a synonym for the Arab Maqam system. A native of Syria, Samer Ali is an Arabic violinist and the artistic director of Takht Al-Nagham. He currently performs with the National Arab Orchestra and the New York Arabic Orchestra. Samer began studying western classical violin at the age of eight with Fawaz Al-Ali and later pursued intensive conservatory studies with Ali Mukhtar Babayev. Samer studied the Arab violin and classical music traditions with Ali Farran and Ziad Ajjan (both students of composer and scholar Mahmoud Ajjan), Simon Shaheen, Anwar Hariri, and Muhammad Qadri Dalal. Samer co-founded the Awj Arab music ensemble in Damascus in 2007, and performed with the Ugarit Ensemble, and the Orchestra of the Bronx. In 2010, Samer was featured by Moncef Genoud at the Damascus Opera House. He has collaborated with musicians in the United States and Syria, such as Khaleel Haj Hussein, Ramez Khaskiyya, Bassam Saba, and Michel Merhej Baklouk. Wajde Ayub is a classically-trained Syrian mutrib (principal vocalist, the one who conveys tarab). He was born in Aleppo, and started to sing and play the Oud at an early age. For over twenty-five years, he has performed with most of the leading musical figures of Aleppo, like Amer Amouri, Safwan Al-Abed, and Shadi Jamil. Having toured in Europe and Latin America, he has performed in the U.S. since 2006. His primary focus is on the wasla, an Arab musical suite that has a specific set of composed and improvised forms like the Muwashah, Taqsim, and Qasida, etc. Wajde Ayub is likely the most specialized singer of the wasla in the U.S. today. He was trained to memorize dozens of classic Arabic compositions which he recites and spontaneously improvises on during a performance; a particularly demanding task for a takht. The members of the ensemble are hence required to be intimately familiar with an extensive repertoire allowing them to seamlessly perform complex phrasing without the aid of musical notation.